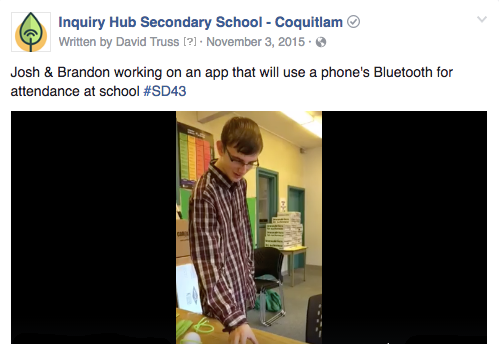 In 2015, two grade 11 students at iHub, Josh & Brandon, started work an app using iBeacon technology to help our teachers take attendance. A year later we still don’t have an app for our attendance, yet this is one of many successful student-projects at Inquiry Hub. The project took on a life of its own, and only now do the students have time to develop the school attendance app. When they first started work, Josh was developing the Android version of the app, and Brandon wrote the iOS version. They set the creation of the apps, and the learning associated with them, as the goal of their Independent Directed Study (IDS) for the year. As work on the app progressed, the boys entered a local ‘Pitch Your Idea‘ contest, and while they were rehearsing their pitch, they were advised by the Tricelerate team running the contest that the application could be useful to businesses and not just schools. Brandon and Josh ended up winning the contest and along with the $500 prize, they also received in-kind advising, and a mentor from Tricelerate, who was excited about the potential of their idea. With the app becoming a complete ‘Workforce Management’ solution, their mentor connected them with a local construction company and the boys started beta-testing the app with foremen and employees on two different worksites. Time Management (the boys put in about 25-40 hours a week into this project beyond their school work). They also had prototype testing which included putting their sensors on construction sites, having employees download their beta versions of their app, and working with the foreman to fine tune features. 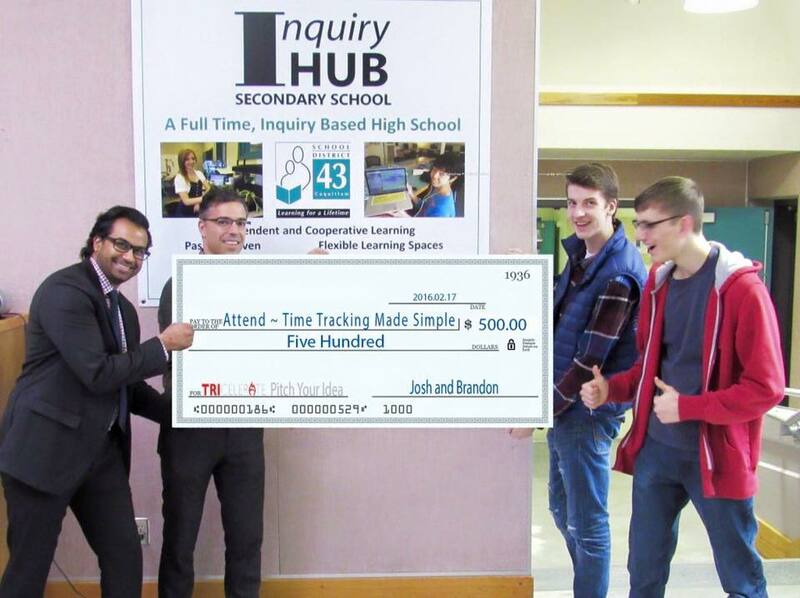 Even though everything on the list above went beyond the original plan for their IDS course, Brandon and Josh were able to pursue these learning tasks and skills because of Inquiry Hub’s incredibly flexible schedule. Everything on the list above was relevant and needed to happen to get them to the point where they could make this a viable business. From legal issues around starting a company as minors, to learning about pricing, conversations with these boys became lessons where he felt more like a student than a teacher. 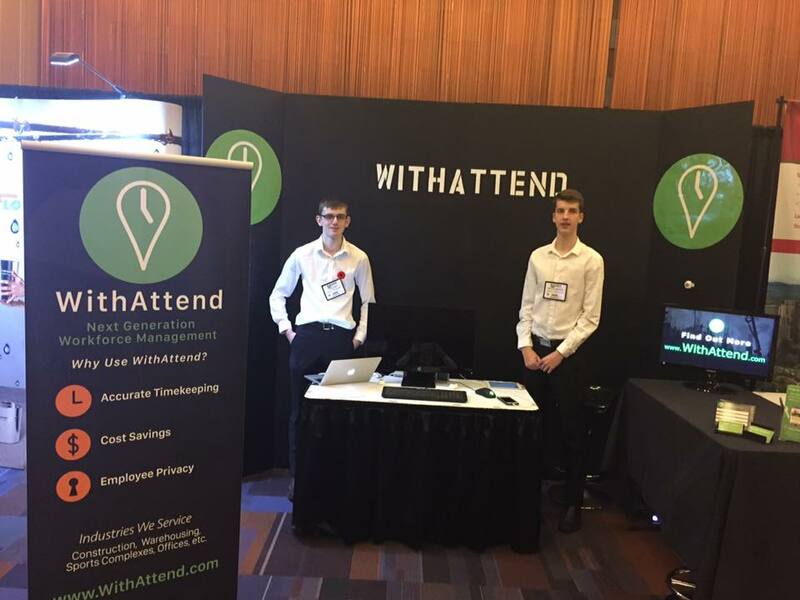 Instead of presenting just to their teachers, the boys were presenting to business owners, and even turning down funding and investors that other businesses could only wish they were getting. When learning is relevant, criteria is far less important than when students are doing work to meet the needs of an assignment. I felt that my job was far less to teach, and far more to ‘stay out of the way’ of what was happening. That said, the boys had their parents and a mentor involved and I was not only getting updates, but connecting regularly with the boys to learn about their progress. On occasion I offered suggestions around things like the website and other general advice; sometimes this was useful; sometimes they’d explain to me why it wasn’t feasible or how they could do it better. In many cases, I was the one learning. Currently, Josh and Brandon are actively searching for clients, and have decided to finish the school attendance app as well. In doing so, they will have a working proof of concept and, if it works well, a glowing recommendation from their Vice Principal. As part of their efforts to promote the product, they set up a booth at BUILDEX Express, a one-day tradeshow and conference for the Construction, Property Management, Interior Design and Architecture industries.